These bad boys were done by Wachuka, who cooked them just perfect! There is a lot of butter that goes in to this, but hey, like Julia Child said “With enough butter, anything is good.” You have to agree with Julia, there is nothing more glorious than butter! It may not be good for the waistline, but on such an occasion it is necessary! 1 To make the sauce, mix all of the ingredients together in a small pot set over low heat and stir constantly until the butter melts. Once the butter melts, whisk the sauce vigorously off the heat and set aside. It should remain liquid throughout the cooking process. If it starts to solidify, heat it up just enough to melt it, whisking all the time. You don’t want this sauce to boil. 2 Using a sturdy chef’s knife or poultry shears, cut off the wing tips and either discard or reserve (we usually freeze) for making chicken stock. Use the knife or sheers to separate the drumettes from the flats (the mid-joint wings). 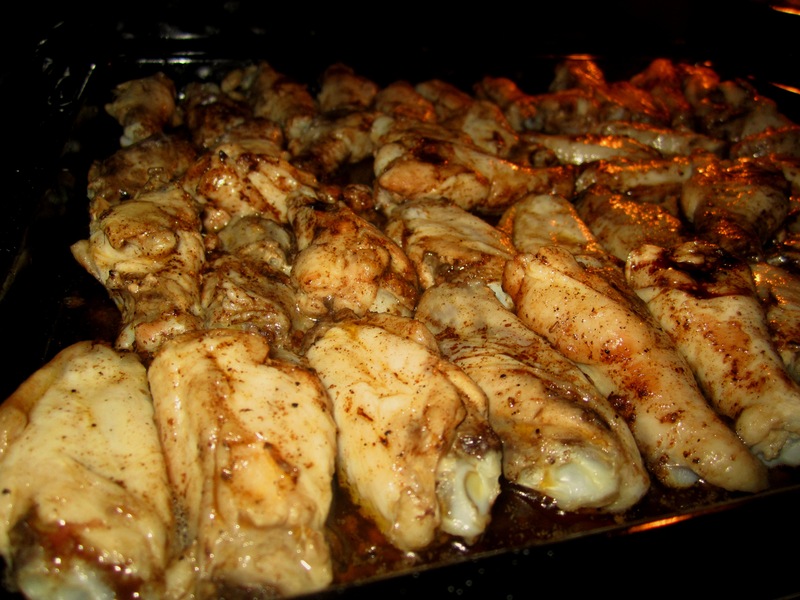 3 Toss the wings with the vegetable oil and the salt, and arrange in one layer on the grill set over low heat. If you are using charcoal or wood, it will be very difficult to do this, so set your fire on one side of the grill and arrange the wings on the other side, away from the direct heat. You want them to cook slowly, with little or no sizzle. Cover the grill and cook like this for 30 minutes. 4 Turn the wings and paint with the Buffalo wing sauce. Close the grill and cook for another 30 minutes. Repeat the process, until the wings are done to your liking, this time painting the wings every 15 minutes or so. Make sure you have a little leftover sauce to toss the wings with at the end. This should serve 1-12 people, but I’d suggest doing more for those sticky fingers in the kitchen! Hey Lucille! a stick of butter is usually about 113g. I usually put a tablespoon more, but that’s me; I love my butter! There is nothing more heavenly than butter:) But don’t go clogging arteries, so about 113-115g will do! Enjoy cooking and let me know how it goes!